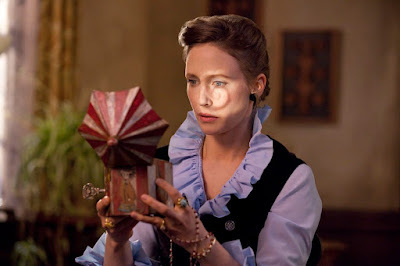 Our weary eyes have peered into nearly every dark corner of every rickety old house that has ever been seen in a horror film, but when it comes to the jaunt occurring in James Wan’s “The Conjuring,” there is cause to question our preconceived understanding: it is, in a rare instance, an excursion of undeniable freshness. That is not to say it is a particularly original one, mind you, but the nature of its focus challenges us to consider the possibilities of multi-faceted perspectives. Elusive among many modern ghost stories, this movie thinks outside the box, merges multiple concepts and carries an audience through an arsenal of thrills that are not cheap, swift or overly stylized by visual excess. And that is noteworthy given the limited dexterity of its excessive filmmaker, too; previous at the helm of “Saw” and “Insidious,” Wan has grappled consistently with the beast known as modulation, and frequently succumbs to more sensationalized standards. Does he prefer to second-guess the desires of his audience, or does he not trust his ability to work under the arc of a mild temperament? Here is a film that gets him precisely on the right track, and does so under the guidance of a compelling story, solid characterizations and an underlying menace that genuinely seems like it wants to reach out and cause us discomfort. Houses are often the defining conduit for what is conceivable. All one has to do is take a look at the interiors of a story’s primary dwelling – many of them are either crumbling or in bad need of refurbishment – in order to harvest a sense of the dangers lurking underneath the floorboards. Think of the strange angular construct in “The Amityville Horror” for example, or the dingy cellars beneath the cabin in “Evil Dead.” But the place in question here – an old farmhouse sitting atop a hill – is clever in that regard. It isn’t exactly forthcoming with its secrets. And these aren’t just your typical indicators for generic hauntings or curses, either. A plethora of trouble awaits a family of seven who have just moved into those wide-open rooms, but how would they, even if they were aficionados of horror clichés, detect the foreboding possibilities? How are they to know that they are walking atop a necropolis of painful memories, and that the faint apparitions that remain behind are trapped in a cycle of cautionary panic against an even graver menace that seems to imprison them? The best sorts of scary films are those where the reality is shielded by the resolve of characters who are enamored with everyday routine, because a more conventional pass will detract from an obligatory anticipation of zany supernatural antics. While that isn’t necessarily true of “The Conjuring” because of a key subplot that implicates underlying horror, it is nonetheless understated about those likelihoods. The story opens with an elaborate yarn (or is it?) told by a couple of popular demonologists named Ed and Lorraine Warren (Patrick Wilson and Vera Farmiga), who play through details of a past riddled in malevolent confrontations like seasoned professionals recounting innocent fairy tales. For them, a mere case like one involving a doll possessed by a demonic spirit are simply part of their line of work, a moment in a mental scrapbook of otherworldly contact. Are they seers, or just more in-tune with the energies of the alternate plane? An early title card implicates them in a lengthy array of experiences, but warns ominously that even they have yet to encounter what is about to transpire here, in a situation where they will come to deal with more than just a basic force at unrest. Then, we meet the core family in question: Carolyn and Roger Perron (Lili Taylor and Ron Livingston) and their five young daughters, who have won an anonymous auction on a farmhouse nestled in the distant hills of Rhode Island and arrive, quite enthusiastically, to discover a home of wondrous possibility. It has lengthy corridors, large rooms, towering staircases… and even a secret basement, buried behind boards and nails that seem to suggest forbidden treasures. Naturally, the curiosity of the new tenants proves to be foolish. Soon after their discovery, strange occurences possess them. Noises around corners cause raised hairs. Then there are cold drafts and sour smells. The family dog is discovered dead behind the house. One of the girls begins sleepwalking, and drifts towards a wardrobe that makes independent noises. And then two of the young girls – one naïve and one fearful – begin seeing visions of strange figures with mysterious agendas, and a continuous stream of violent encounters force them to seek outside help, namely from the same key figures that set the scene from earlier in the film. The screenplay is by Chad and Carey Hayes, writers of a handful of other recent horror films that, by most measures, would imply troublesome roads ahead (their “House of Wax” remake, as a leading example, was one of the worst movies of last twenty years). Either they have reconsidered their aesthetical values or have taken the advice of colleagues to retrain in the fine art of script writing, because the results they yield here are of an entirely different classification. Just as their backstory is rich in details, so are their characters well-drawn embodiments of fearful protest. They do not surrender to mere confusion, but use their anxiety in a host of tricky plot scenarios to dig beneath the terror and find its wild source. The gimmick, in this case, is that they are actually being followed by a host of spirits – some of them menacing, others innocent, and one so utterly mad and vicious that it dares to attack with the intent of fatal harm. The Hayes brothers flip back and forth between “Poltergeist” and “The Exorcist” as sources of inspiration in this regard, but do not make a derivative interpretation of those premises. Likewise, Wan marries it all to a direction that is urgent when it needs to be and subtle at other moments. After so many tonal shifts and stylistic peaks and valleys littered in his prior endeavors, at long last he has implored the right choreography for the story he is given, and gives us a result that is not only well made, but actually quite convincing at supplying scares. And though the final act is littered in twists one can see coming from a mile away, they are displayed with such convincing energy that they succeed at garnering the necessary reactions. If you consider “The Conjuring” in more broad contexts, then the trend of the genre seems to be tipping into more promising favors. Sure, for every film like this there is another that is only interested in spilled guts and horrific screaming. Sure, the ham-handed conceits of showmen like Eli Roth will force us to persist with the notion of gratuitous geek shows at the local theater chains for well into the next decade. But they have gradually become fringe endeavors on a radar previously dominated by the likes of “Saw” and “Hostel.” No one thinks about them anymore because there are only so many bloody limbs to go around. What are the movies of the modern time that we can recall with certain enthusiasm? The list includes “The Ring,” “The Grudge,” “Insidious,” “The Exorcism of Emily Rose” and “The Babadook” – all films that exhibit a cohesive marriage of production values and narrative insights that allow their ideas to erupt in vigorous fashion (and often in effective jolts). They create an affect that tests our endurance rather than the strength of our stomachs. Here is another example of that tradition, a movie that exemplifies the golden standards of the haunted house formula and escalates them to something rather rousing.